A jib top is a high clew jib designed for reaching in medium to strong winds. Any time you would normally be using your jib with an outboard lead the jib top will be the fastest option. This sail fills the gap between the normal jib and the code 0. We have spent a lot of time at Ultimate Sails developing our Lightwave Jib Top and it has proved a fast and cost effective addition to the sail wardrobe. The recent rule change which now means you can fly the Jib Top from a bowsprit or spinnaker pole has made this sail even more effective, widening its wind angle range and increasing performance. The sail can be supplied with an anti-twist rope and used with a furler for fast and easy sail handling. 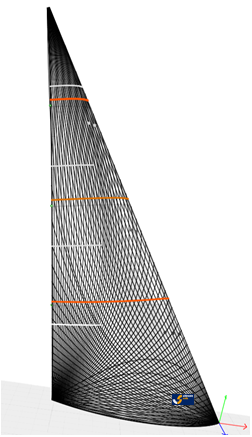 The IRC Code 0 fills the gap between the widest effective wind angle of a headsail and the narrowest wind angle of a reaching downwind sail (approx. 35 to 95 deg. AWA). It measures as a spinnaker (with a mid-girth of more than 75% of the foot length) so it doesn’t affect your IRC rating as long as you don’t carry more than your spinnaker quota. A Code 0 in the inventory typically adds 10 to 20% more speed in sub 10kt conditions and they can be flown from a bowsprit, a spinnaker pole or direct from the bow of the boat.